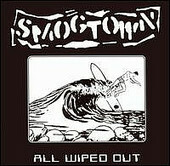 A posthumous debut sounds like an oxymoron, but in the case of the quartet that comprised Smogtown, it all makes sense. This California punk rock troupe's ultimate goal was to not only destroy rooms when playing, but also to dispel the great American myth that the West Coast was the ticket to utopia. And, even though the outfit's inner workings proved to be as volatile as its music, Smogtown pulled of the feat that punk rockers today would run away screaming from; telling the truth. Despite All Wiped Out's brevity (only eight songs on the disc), it's more punk rock that any of Blink 182's albums combined. Get it and learn something.